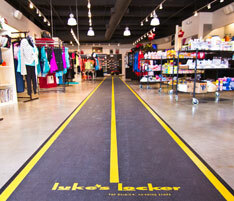 When our running shoes hit mile 350, we turn to Luke’s. This one-stop fitness spot is famous for its hands-on assistance in fitting customers with the perfect athletic shoe. The staff is courteous, helpful, and, above all, not pushy. We once went in complaining of calf problems and were seconds away from buying a new pair of shoes. Instead of pushing us, the staffer suggested modifications and explained that the problem wasn’t our shoes. He was fine with not making a sale. He really just wanted to help. That’s why all our new pairs come from Luke’s. You’ll find all the Nike workout ensembles, casual wear, and other gear you need to get noticed on the Katy Trail, too. If you’re interested in working on your stride, join one of the shop’s organized running groups or marathon training programs. Update: The Oak Lawn location has moved to Mockingbird Lane.